It’s been a while since I’ve done one of these. Not for any reason in particular, I just get caught up doing other things. Stuttgart Fixed Gear is a blog run by Magnus out of Stuttgart, Germany. Mangus is a mechanical engineering student with a love for fixed gears and cycling in general. You may have seen the photo above before, but no one really has a description as to what its significance is. Mangus met Thomas Dorsch while in Stuttgart. Thomas is an avid BMX rider and the mind behind Svevo bikes. You remember the Svevo Métisse right? Métisse means “half breed” and that’s what the bike is; a half breed of a BMX and a fixed gear. Last weekend Mangus and the guys in Stuttgart test rode a Métisse and the above photo is from their session. 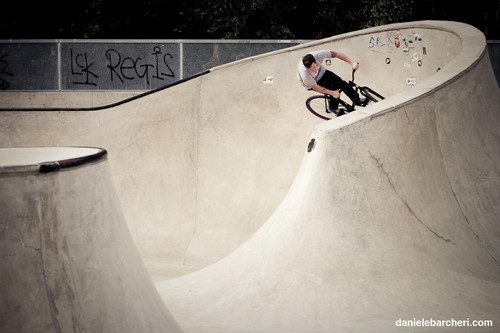 Be sure to check out more at Stuttgart Fixed Gear!